On Friday 9/25 library staff and kids helped our new teacher, Leo, celebrate her birthday with games, a pinata, cake & ice cream, yum! Leo has initiated a new system for points, the rewards that children get for the work they do at the library. Under the old system, kids would work for the afternoon and based on the number of points they garnered, could chose a small prize for the day. Under the new system, kids must work all week long to accumulate points, and their prizes are awarded to them based on whether they achieve a minimum, medium, or maximum amount of points. This new system was started to motivate kids to participate in library activities in a more sustained way, including afternoon classes that are given 5 days a week. The rationale behind the new system is also to help the children start to realize that learning has its own inherent rewards. Eventually, points will be awarded on a less frequent basis so that the children learn that learning is fun--even when you don't win points, you "win" knowledge! Every Friday the kids gather around to see who won the most points, and they receive their prizes, which are selected for each child based on his/her own preferences and learning needs. Children are awarded toys, but also learning materials such as flashcards or books. After the party, kids were awarded their weekly prizes. Just look at these happy faces! Special THANKS to all our wonderful library friends who bring down these wonderful items for the kids. 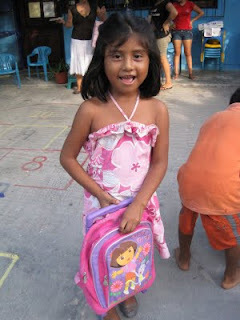 Proud winner of a Dora backpack, this little girl earned maximum points!